Happy Saturday from Altus, Oklahoma. Andrea’s grandmother fell Thursday breaking her hip and dislocating her shoulder. So we’ve gone down to visit for the weekend. Enlightening (pardon the pun) video from Mute Math’s drummer. He has lights that are keying off his drums. Cool stuff. Free song download from Anberlin, “Feel Good Drag“. Great song! Freakonomics is at it again with useful Olympics analysis. Apparently Jamaica won the most gold medals per capita in Beijing. Interesting post on the worst concerts ever. The time has finally arrived. 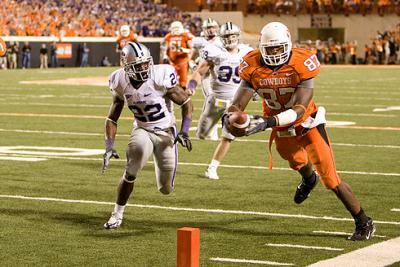 The OSU Cowboys kick off their season today at Washington State. It will be interesting to see how the season goes. It appears that they’ve got a pretty tough conference schedule this year. We got some some cool news today that I thought I’d share. Okay, I thought I’d brag a bit. As you may recall, Andrea and I are going to the LA area soon. We found out yesterday that a friend has hooked us up with VIP passes to The Tonight Show on Monday, September 8th. Very cool stuff. But even better, Andrea discovered this morning that Mr. Olympics himself, MIchael Phelps, will be a guest that night. Extremely cool stuff. I must say that we’re quite excited. It’s time for a little birthday experiment. Friend and fellow blogger, Kevin Osborne, is experiencing an annual rite of passage today known as a birthday. So, I’d like to ask all of you to do one of three things. Go to Kevin’s blog – godsteknon.blogspot.com – and add a random “Happy Birthday” comment to any post. It doesn’t matter which one. Or, wish Kevin a Happy Birthday on Facebook. Feel free to add a comment letting me know. I’ve been thinking a lot this year about the presidential election. In my opinion, the most qualified people are either not egotistical enough or too smart to actually run for president. That means that we have to decide who we’re willing to settle for. In an interview on NPR yesterday, Michelle Obama talked about the “game” of politics. It’s really too bad that it is more of a game, than genuine servanthood. Early on this race, I took a liking to Barack Obama. My dad said it was because I didn’t know enough about Obama to dislike him. He was probably right. I admit it, I’m drawn to Obama’s charisma. He’s exciting. McCain is kind of boring. I really struggle to see him as a maverick. I don’t see eye-to-eye with Obama on many issues. But I believe him to be a man of character based on what I’ve read. I believe he is a strong Christian. I believe he has more capacity to unite than McCain. I believe that he is a change agent. I like the fact that he’s black. I need to do some more research on McCain. I’m just not sure that he is somebody I can vote for. Time will tell. If I vote the issues, I probably lean towards McCain. If I vote character and leadership and change, I lean towards Obama. Those are just my thoughts at the moment. I’m sure they’ll change. I saw this guy on the news recently. His name is Nathan Sawaya, and he’s a lego artist. He’s my new hero. Some of his sculptures are absolutely incredible. He has dozens of photos on his website www.brickartist.com. Once again, it was not your typical Sunday at GracePoint. For one thing, I played in the band for the first time in two months. For another thing, I played snare drum on one song, Whip It. But even better, we played Whip It in costume. Why?, you may ask. Because we can. You are currently browsing the From The Mind of MandoRon blog archives for August, 2008.